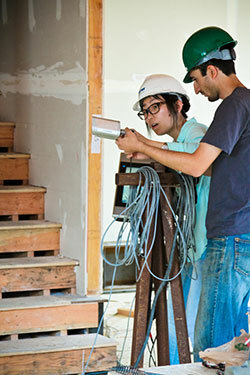 A team of researchers, led by Colorado State University engineering professor John van de Lindt, has spent the last month shaking a four-story building on the world’s largest outdoor shake table at the University of California, San Diego, to learn how to make structures with first-floor garages better withstand seismic shocks. The four-story building that will undergo a seismic test Aug. 17 at the Englekirk Structural Engineering Center at the Jacobs School of Engineering at UC San Diego. Since July, the team has successfully tested a variety of earthquake retrofits on a full-scale, 44,000-square-foot building built specifically for the tests at the Englekirk Structural Engineering Center at UC San Diego. The structure – three stories atop an open first floor—has survived three of four simulated seismic events of increasing strength on the shake table. “The larger shakes have damaged the building, but with the retrofits in place, it is still structurally safe enough for occupancy,” van de Lindt added. The final test, which the team expects will collapse the building, is set for Aug. 17. To see videos of the first series of tests, go to van de Lindt’s YouTube channel. Van de Lindt, the George T. Abell Professor in Infrastructure in the Colorado State College of Engineering in Fort Collins, Colo., obtained a $1.24 million grant from the National Science Foundation for the research. His team is working in conjunction with Rensselaer Polytechnic Institute, Cal-Poly Pomona, Western Michigan University and Clemson University. Numerous industry partners, including Simpson Strong-Tie and the Forest Products Laboratory, as well as several other government entities are also collaborating on the tests. 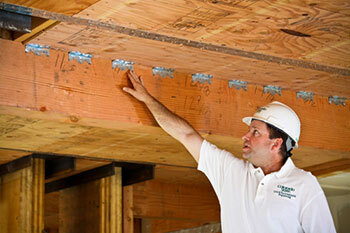 John van de Lindt, a professor at Colorado State University, who is the lead investigator on the tests, shows some of the seismic retrofits the building is equipped with. The research is being done as part of the Network for Earthquake Engineering Simulation in the NSF’s shared facility at UC San Diego. The building is a wood-frame structure with a weak and soft first story—large openings for shop windows or parking on the first floor—common in buildings constructed throughout California in the 1920s and 1930s. It has horizontal wood siding, hardwood floors and gypsum wallboard in place of plaster on the upper three floors. Some of the retrofits being tested were designed in accordance with FEMA P-807 guidelines. This standard was selected because it is approximately equal to the requirements of San Francisco’s mandatory retrofit ordinance, signed into law in April 2013, on the 107th anniversary of the devastating 1906 earthquake. The law requires buildings with “soft-story” conditions to complete retrofits over the next several years. This includes approximately 2,800 buildings in the city of San Francisco, many built before 1978; however, it is clear there are many more throughout Los Angeles and all of California. Two students set up cameras inside the building. The Colorado State research is testing a retrofit using a relatively new material, cross-laminated timber. The first retrofit tested consisted of eight two-foot-wide rocking walls with plywood on the underside of the second floor diaphragm attached with a number of Simpson Strong-Tie straps and clips. The cross-laminated timber is provided by Innovative Timber Solutions-Smartwoods based in Whitefish, Mont. The first test series simulated temblors up to 50 percent MCE – maximum credible earthquake. The second series tested a retrofit with a Simpson-Strong-Tie moment frame in accordance with the FEMA P-807 guidelines and the third a more extensive steel special moment frame and anchor tied-down system, also by Simpson Strong-Tie. The fourth system, using viscous fluid damper frames similar to car shocks, is being tested the week of Aug. 12 and will be in place for the ultimate test. Van de Lindt studies how to improve structures, particularly dwellings, to survive natural disasters from tsunamis and hurricanes, to earthquakes—and even tornadoes. Along with Simpson Strong-Tie and other partners, he successfully led the world’s largest earthquake shake table test in Japan in 2009. 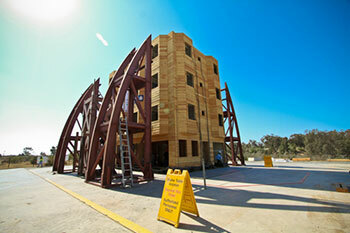 That test showed that midrise wood-frame buildings can be built to withstand major earthquakes.